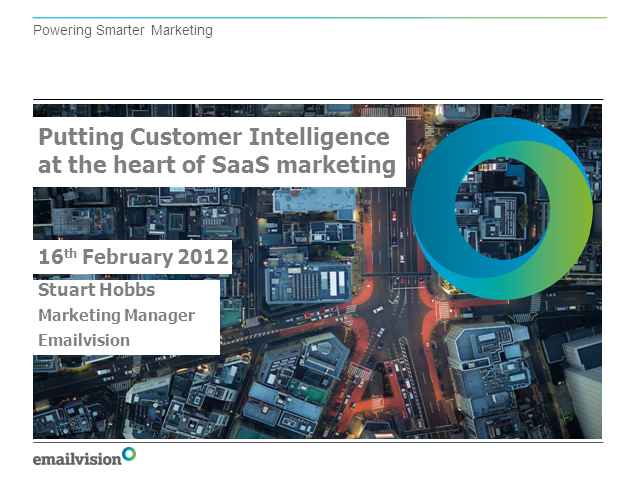 Customer intelligence is shaping up to be one of the hot topics for digital marketers in 2012. It is particularly relevant for those marketing SaaS solutions, where reducing customer churn and increasing monthly recurring revenues are vital considerations. This presentation will look at how SaaS marketers can realise the potential power of their customer data to drive more targeted and personalised campaigns, which will deliver improved ROI through significantly increased relevancy. As Northern European Marketing Manager for global SaaS marketing vendor Emailvision, Stuart Hobbs is responsible for all marketing activity across the UK, Netherlands and Scandinavia. He joined Emailvision in 2011, from Exchange hosting vendor Intermedia. He has a strong track-record of direct and channel marketing success at high-growth technology firms such as mobile messaging specialist Synchronica PLC.